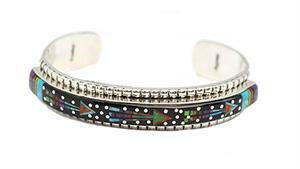 Sterling silver 1/2" wide bracelet shank with inlay on top in night, shooting arrow design. It has black jet background with silver dots through out and also has blue, purple and green turquoise and spiny oyster. It is Navajo hand made and inlaid by Sammy Smith. Shank has stamping down the ends and on the inside of the shank as well. It is a 5 1/4" wrist size. Only this one available.